It's party conference season, and we're always looking for new ways for our young people to engage with MPs and decision makers. 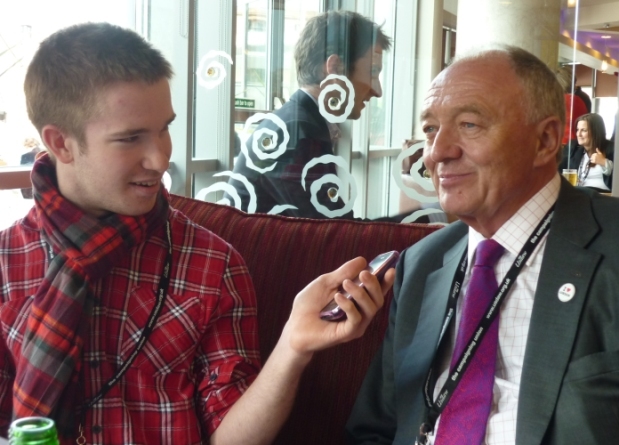 This year we downloaded Audioboo's free app onto a smartphone for 17 year old ambassador Jamie, to capture some great audio / podcast material at the Labour conference. Audioboo is a web and smartphone based application that allows you to record five minutes of audio, attach a photograph and location data, and upload instantaneously to the web to share with the world. Our Public Affairs Manager set up lunchtime meetings with as many MPs as possible – we also knew we'd be able to doorstep a few! After talking about the work we do, Jamie disarmed them by asking a few quick fire and fun questions using Audioboo. I hoped for some nice content we could share on our website and social media – but when I pitched the set of 20 'boos to Clare Horton at Society Guardian, one interview with Ken Livingstone captured her imagination. It seems we 'scooped' the fact that Ken had been invited by the BBC (but declined) to appear on Strictly Come Dancing – a show that has just appeared back on our screens. With the topicality of the party conferences, Ken's bid to return as London's Mayor and the BBC's Saturday night flagship returning, our interview with Mr Livingstone made Society Guardian Daily, reaching upwards of 930,000 eyeballs including email subscribers. In addition to this, we discovered Lord George Faulkes has a penchant for Benidorm, and MSP John Park googles himself regularly; these two tidbits were picked up for the diary section of Scotland's current affairs magazine Holyrood. Sometimes a more lighthearted approach can result in raising awareness of a charity. All the MPs and MSPs took the interviews in good humour, and many retweeted to their Twitter followers that they had met us. By building relationships and creating comms that contain human stories, we are building trust and promoting our particular brand of fun, friendship – and sometimes mischief. It’s important to us that a young person and user of our services was creating this content, and contributing to its success. Beneficiary becomes producer and curator; this is an empowering combination. The media coverage we secured off the back of the ‘boos was the cherry on the cake, and were sold in using Twitter. We intend to repeat the project at the Conservative conference. How can you empower your charity’s users, and are there ways of combining new media and old by being creative in your campaigns? In his day job, Rob leads on all public relations for young people’s charity Whizz-Kidz, including corporate fundraising partnerships, youth campaigning, NHS partnerships and parliamentary work and most notably social media: building conversational, community engagement in Twitter, Facebook, Youtube, and Flickr. Rob blogs on third sector issues, Big Society, and digital comms and founded the Third Sector PR & Communications Network on Facebook.